Accommodation price: 1.Kotech double room with balcony. One day 750 hryvnas Discounts by appointment. 2. Kotezh 2 + 1-bed room without a balcony (a little bigger) One day 750 UAH. Discounts by appointment. Description: Two single-storey houses are one on 2 and the second one is 2 + 1 person. Each house has a double room: double bed, closet, TV, fridge, electric kettle, bathroom (shower, WC, hairdryer). Extra bed is free of charge – a folding armchair. 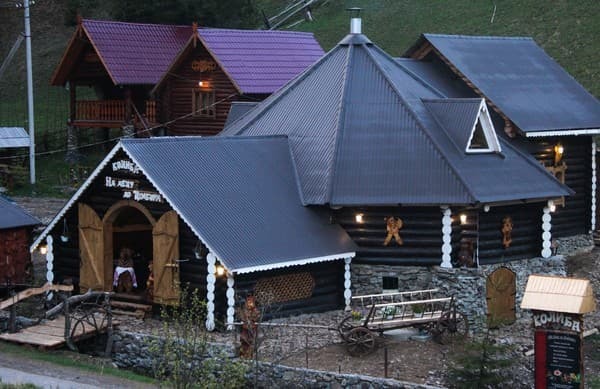 Food: Nutrition at Kolibi-Restaurant “Na Deca To Tsimbora” , with a discount of 10% for residents.You are invited to a hotel on the lake Synevyr “In Tsimborki” . 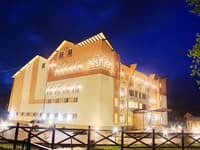 It is located near the lake, so vacationers will have the opportunity at any moment to contemplate the surrounding beauty. There is everything for a comfortable stay: cozy rooms with comfortable furniture, autonomous heating and water supply, which is necessary for even more exciting recreation of equipment on site, professional and friendly staff. At any time, you can contact the hotel’s staff and get the help you need . 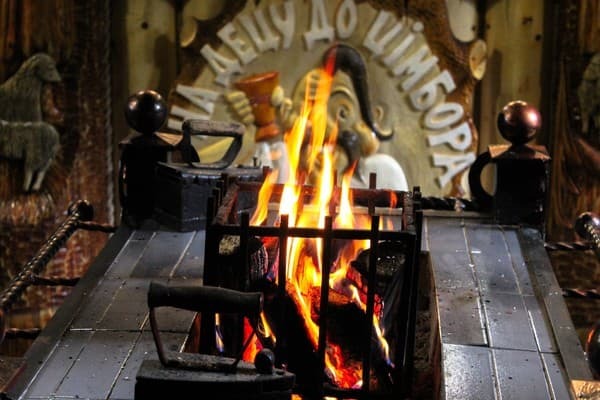 The best restaurant “Na Deca To Tsimbora” In such conditions you will have only one thing – to enjoy your vacation, to receive positive emotions and to recharge for a long time. Check arrival: from 13:00 - 23:00 hours. Check leaving: to 11:00 - 12:00 hours. In Na Detsu do Tsimbora Kolyba is available and should be arranged in advance. Transcarpathian dishes. Specialties — Bohrach from Tsimbor, Banush with mushrooms, trout. Set meals are available. 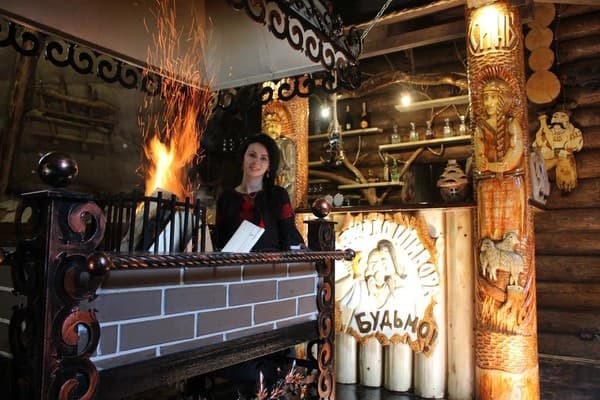 By public transport Go by any train of Uzhgorod direction to Volovets station, then go by bus (except Saturdays and Sundays) to Synevyrska Polyana village with a change in Mizhgirya. Another variant — go by bus to Mizhgirya, then go by bus to Synevyrska Polyana or go by taxi. Detailed information about public transport. 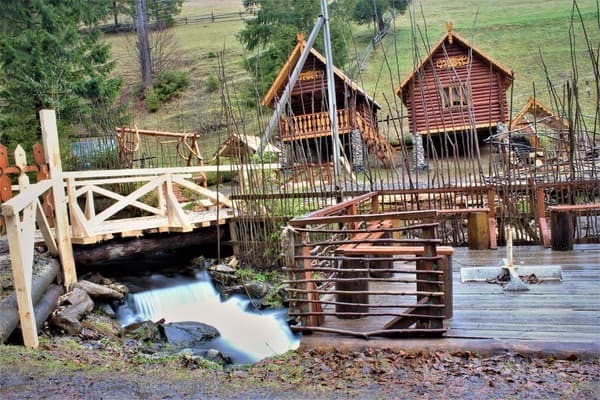 By car Go along the road Kyiv–Lviv–Chop (M-06), in Nyzhni Vorota village turn to Volovets, go towards Mizhgirya. 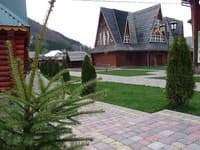 In the village centre turn towards Synevyr lake sign board and go about 30 km to Synevyrska Polyana village. The cottages are located at the entrance to Synevyr Lake.